Where does LG's new phone fit? Today saw the unveiling of the LG G2 in New York and if you think we missed an 'Optimus' in there, we didn't. 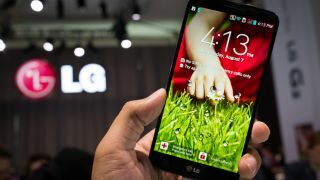 LG has decided to drop the Optimus branding and keep things simple with just a letter and a number. The LG G2 is the South Korean company's latest and hopefully greatest phone. With a 2.26GHz quad-core processor and 2GB of RAM, it's got enough power under the hood to give the competition pause, but the real focus seems to be on making a device that learns from the user and one that's intuitive and easy to use, even with just one hand. The LG G2 isn't likely to win any design awards. It has a plastic body rather reminiscent of the Samsung Galaxy S4 and, well, it doesn't look amazing for it. Its 2.7-inch wide body is at least quite sleek, due in large part to the placement of the buttons on the back, leaving nothing to break the lines when viewed front or side on. Ultimately the LG G2 can probably give the Samsung Galaxy S4 a run for its money in the design stakes, but that's not saying much and in comparison to the premium metal builds of the HTC One or the iPhone 5 it just can't compete. The LG G2 has an impressively large Full HD 5.2-inch IPS edge-to-edge screen, which LG claims is the largest size the average person can comfortably hold with one hand. Not only is it big but based on our time with the phone, it provides clear images. LG has some competition on the screen front though as the Samsung Galaxy S4, HTC One and iPhone 5 all also provide top-flight displays. The Samsung Galaxy S4 has a 5-inch Super AMOLED display, the HTC One has a 4.7-inch Super LCD3 display and the iPhone 5 has a 4-inch IPS display. They're all tremendous quality but the LG G2 scores points for squeezing such a big screen in without making the handset unwieldy, thanks in no small part to its ultra-slim 0.1-inch bezel. One of the biggest and most noticeable features of the LG G2 is that the volume rocker and power button are both on the back. That arguably makes the back a little cluttered and ugly, but it frees up the sides of the phone, as those are the only buttons on the LG G2. So nothing breaks the lines when viewed front or side on, which is how most people will view the phone most of the time. The button placement isn't just about aesthetics though; it's also about ease of use and comfort. LG have concluded that people naturally hold their phones in such a way that their index finger is resting on the back - right about where LG has placed the buttons. Which means that by having the buttons on the back you can comfortably press them without adjusting your grip, both making it more comfortable and hopefully making you less likely to drop the phone when fiddling with the volume. The headline feature of the HTC One on the other hand is probably its 4 Ultrapixel camera. However, the fact that it's crafted from a single piece of aluminium and that it has high quality front-facing speakers are both major selling points too. The iPhone 5's headline feature is arguably its widescreen design and the bump in screen size over previous models. While the Samsung Galaxy S4 really doesn't have one stand out feature, instead aiming to be a jack-of-all-trades packed with many different ones. We're not sure the button placement on the LG G2 is really that exciting though or that it was even really a problem that needed solving. Perhaps we'll be converted once we've spent more time with the phone, but right now it doesn't seem that much more convenient having the buttons on the back than on the sides, so we can't help but feel that it's a feature that falls a little flat, particularly in comparison to its rivals.